Referee Mark Clattenberg has ordered that the Manchester United defeat to Chelsea at Stamford Bridge on Tuesday night should be replayed. After controversially not noticing Wayne Rooney attempt to decapitate Wigan’s James McCarthy on Saturday and then insisting that no further action should be taken against the striker at an FA hearing yesterday, the official has laughed off suggestions that he is biased towards the Old Trafford giants. 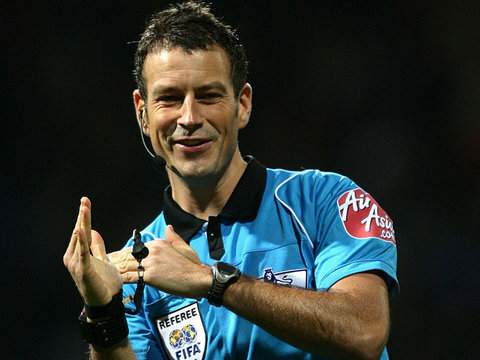 The game on Tuesday night was refereed my Martin Atkinson, but this hasn’t stopped Clattenberg from weighing in with his opinion. He left then after being summoned to clean the shoes of Ferguson. We did not see him take any shoe-cleaning equipment with him, but he did drink hastily from a bottle of water. The replay is scheduled for next Wednesday.